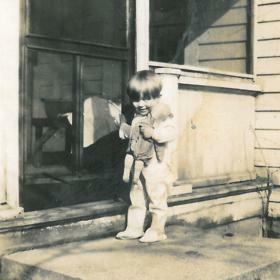 One of six children, Marilyn grew up on a farm near the village of Scott in northern Indiana. 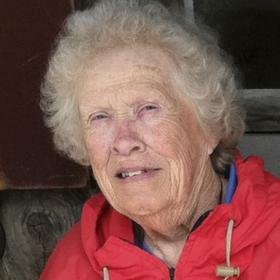 Between her siblings and many cousins on both sides of her family, she always had companions at the local church, 4-H, and school outings in their farming community. Marilyn was born to Ralph and Wreta (Hagerty) Bassett in LaGrange, Indiana in 1931. She attended the local school, a K-12 school house, where she graduated in a class of seven. When not working on the farm, playing piano, or cheerleading at basketball games (cue up the 1946 version of “Hoosiers”), Marilyn worked in her uncles’ general grocery near the school. During World War II, she donated her hair—which needed to be at least 14”—to the war effort for meteorological and other precision instruments, especially in the Air Force. While she never lost the love of all things agrarian, she knew that her future was not on the farm. She even eschewed consuming whole milk and heavy cream after she left the family homestead, perhaps due to one too many pre-dawn milkings. After graduating high school, she enrolled in an associate’s program in secretarial studies at what is now Western Michigan University in Kalamazoo, Michigan. Kalamazoo was a “big city” after farm life and Marilyn relished living there. After completing her studies, Marilyn began work at the Upjohn pharmaceutical company and moved into an apartment with friends on Axtell Street in Kalamazoo’s Vine School neighborhood. Bowling was their main social activity and one Friday night, Marilyn was introduced by mutual friends to David “Dave” Anderson. He was reserved, just back from military service in Europe with a passion for both books and engines, and her red hair and sharp wit caught his attention. 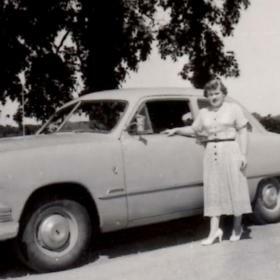 His young nephews were impressed that Marilyn drove her own car at a time when many women living on the farms on Kalamazoo’s western outskirts still did not have a license. 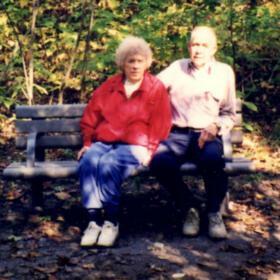 They married on October 27, 1956 in Scott, Indiana followed by a vacation in the Wisconsin Dells. They then relocated to Hialeah, near Miami, where Dave was enrolled at Embry-Riddle Aeronautical Institute and Marilyn began work as a secretary at National Airlines. While they enjoyed the winters in southern Florida, Marilyn and Dave returned to Kalamazoo after he completed his studies. Dave began work at a few small windsock, grass strip airports west of town, while Marilyn began working full-time at home after the birth of Stuart, their oldest child. Over the next six years, Marilyn and Dave had four daughters in quick succession: Stephany, Susan, Sara, and Sonya. Stephany was born with Down Syndrome, and while Marilyn and Dave were strongly encouraged to place her directly in the Coldwater State Home, they declined and brought Stephany home from the hospital. Before the era of chat rooms and Facebook support groups, Marilyn began to seek out, by word of mouth, the growing number of parents in the area who were also raising their children with Down Syndrome at home. When Stephany turned 4, she enrolled at the John F. Kennedy Center for children and young adults with developmental and physical disabilities in Kalamazoo. All of the Andersons were active in one way or another at the Kennedy Center, but Marilyn found her life calling as an advocate for Stephany and her peers. She became a “super” volunteer at the Kennedy Center, was an early volunteer organizer with Kalamazoo Special Olympics in the late 1960s, and an active member of the Kalamazoo ARC (KARC). Marilyn managed to balance a myriad of car pools for all five kids while often preparing for her next meeting, whether with other parents, school administrators, or community officials, regarding how to enhance and expand the lives of Kalamazoo’s residents with developmental disabilities. She took copious notes in short hand on legal pads while on a call, a habit that carried over from her days as a secretary. In 1980, she received the KARC Community Service Award and she received the “Volunteer of the Year” award from the City of Kalamazoo in 1987. Marilyn received awards of appreciation from Kalamazoo County Special Olympics in 1996 and 2001. While Marilyn and Dave were quick to keep Stephany at home rather than send her to Coldwater after she was born, they were resistant, as were many parents of their generation, to have Stephany move into a more independent setting after she completed her program at the Kennedy Center when she turned 25. In those years, Marilyn usually drove Steph to all of her activities around Kalamazoo, ranging from MRC ArtWorks to gymnastics to reading classes, and both Marilyn and Dave enjoyed joining other parents in Mount Pleasant for the summer State Special Olympics where they cheered on the athletes. After triple bypass surgery in 1998, Marilyn cut back on her advocacy, ceding the work to younger parents, professionals, and the growing group of people with mental and physical disabilities, who were lobbying and organizing, whether in Lansing or in their communities. In these years, Marilyn, Dave, and Stephany enjoyed exploring Michigan and keeping up with current affairs. While Marilyn read the Kalamazoo Gazette and Dave read his latest book, Stephany would focus on one of her hundreds of word search books while sitting with them. 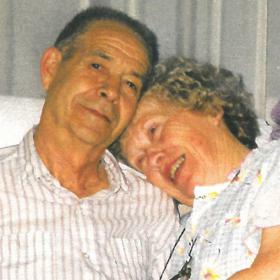 As Marilyn and Dave moved into their senior years, Stephany helped them more around the house. Marilyn could be stymied by the physical limitations of aging as well as her slowly advancing dementia. She was particularly challenged by the pervasive use of computers and smart phones and rued, to her very end, the transformation of her much beloved Kalamazoo Gazette from a print daily to a digital news site. Dave passed away in early 2013 after a fall and Stephany moved to the Hoard Manor group home later that year where she was a resident until she died in late 2016. Marilyn lived at home until late 2014, at which time she became a resident of the Heritage Community where she was able to live with assistance from the professional, nurturing, and caring staff of the Upjohn Care and Rehabilitation Center. Marilyn died peacefully at Upjohn at age 87 on July 16, 2018. She was preceded in death by her husband, David, of 57 years, and her daughter, Stephany. Marilyn is survived by four children: Stuart, Kalamazoo; Susan (Doug Shulman), New York City; Sara (Bruce Gould), Chicago; and Sonya, Denver. She leaves behind two grandchildren, Ben and Eve Shulman of New York City. She also leaves behind many Anderson and Bassett nieces and nephews. Marilyn was also predeceased by her parents, her five siblings, and three of their spouses: Charles Bassett (Loann), Martha Lou Lee (Bob), Charlotte Miller (Jim), Elaine Kronewitter, and Jane Eash. Paul Kronewitter and Gerald Eash survive her. Marilyn received exemplary attention in her final days from staff at both Upjohn and Hospice Care of Southwest Michigan. Her family knows that Marilyn would appreciate donations made in her name either online or via mail to Special Olympics Michigan Region 16, 50505 Meadow Oak Trail, Mattawan, MI 49071; MRC ArtWorks, 2538 S 26th Street, Kalamazoo, MI 49048; or Residential Opportunities, Inc -Hoard Manor, 305 West Cork Street, Kalamazoo, MI 49001. A private burial and service took place at Genesee Prairie Cemetery. A celebration of the lives of Marilyn and Dave is planned for later in the year where all are welcome. Her family welcomes condolence messages. Please visit Marilyn’s personal web page at www.BetzlerFuneralHome.com, where you can archive a favorite memory or photo and sign her online guestbook. Arrangements by Betzler Life Story Funeral Home, 6080 Stadium Dr. Kalamazoo (269) 375-2900. Marilyn would want you to pay it forward.